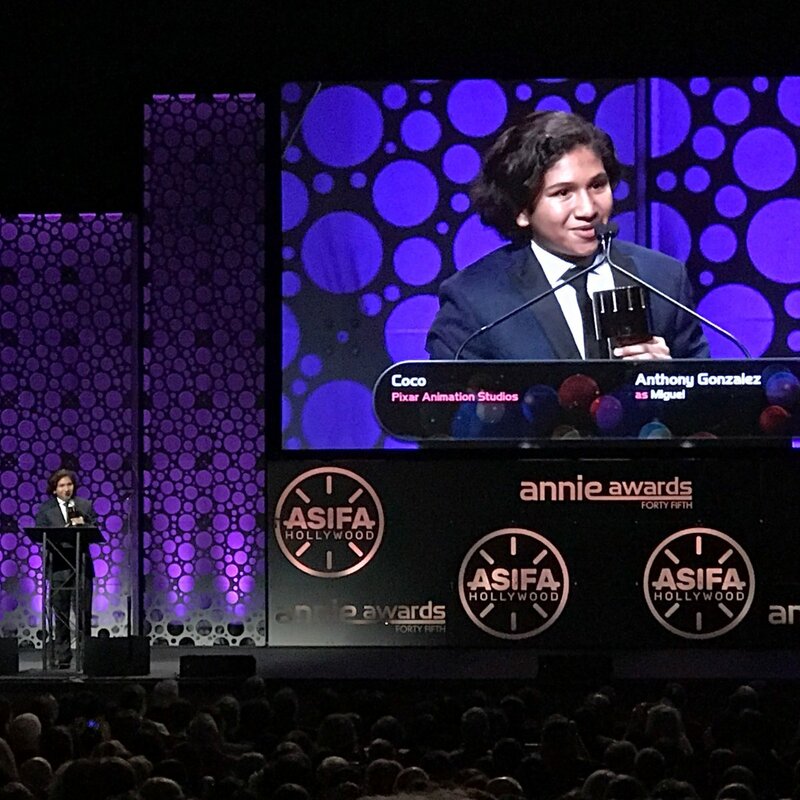 Coco won a record 11 awards, including Feature, Director, Writing, Character Design, Music and more, at the 45th Annie Awards held at UCLA Royce Hall. The Disney Pixar film won every award category in which it was nominated. 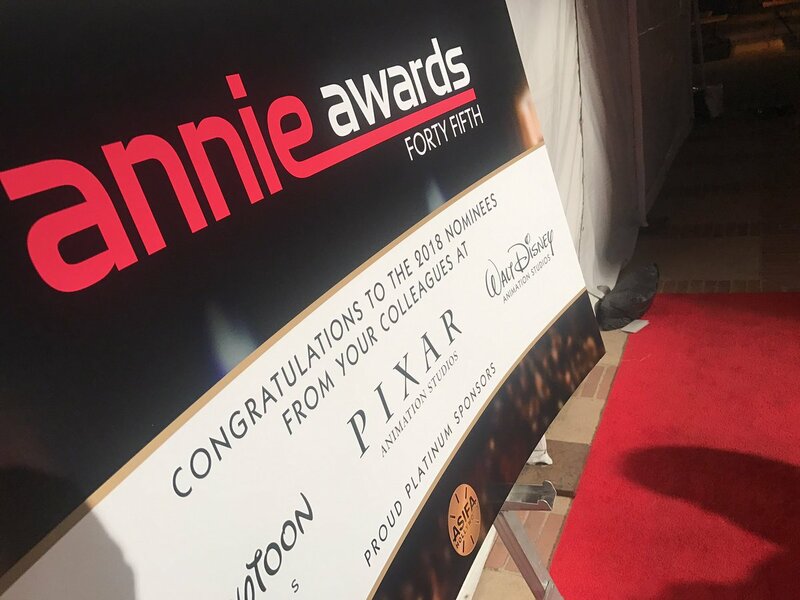 The Annie Awards honor overall excellence as well as individual achievement in a total of 36 categories including best feature, production design, character animation, effects animation, storyboarding, writing, music, editing and voice acting. The awards have often been a predictor of the annual Academy Award for Best Animated Feature. 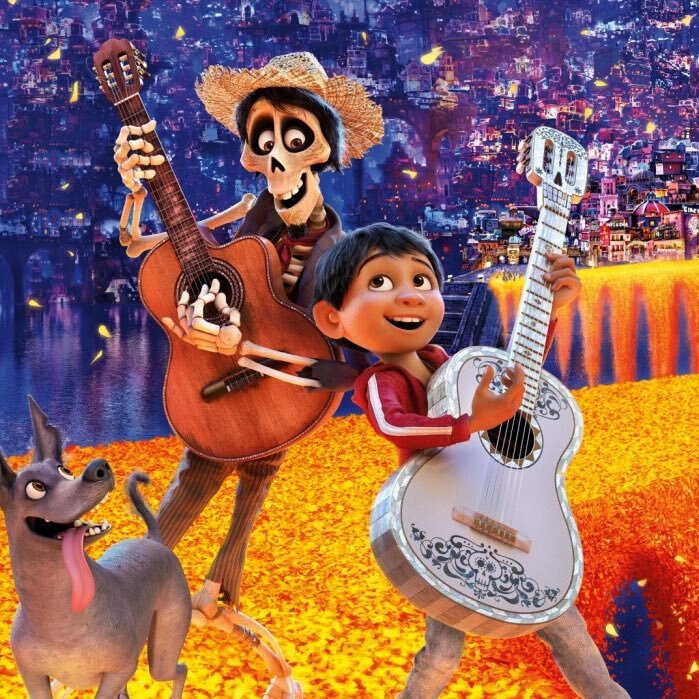 Animated Feature: Producer Darla K Anderson spoke on behalf of Coco, which included several cultural consultants from Mexico. “Representation really matters” Anderson said in her acceptance speech. “We hope and strive for more diversity and inclusion” in our studios and our stories, she said. Voice: Anthony Gonzalez, voice of Miguel. “I wanna dedicate this award to all the spirits that are out there tonight,” said – lead production designer Harley Jessup. Harley won the inaugural Animation award at the Art Directors Guild award the previous weekend. Editorial: Steve Bloom, Lee Unkrich, Greg Snyder, Tim Fox. Character Animation in a Live Action Production: War For The Planet of The Apes (Chernin Entertainment, TSG Entertainment, River Road Entertainment, 20th Century Fox, Daniel Barrett, Sidney Kombo-Kintombo, Emile Ghorayeb, Luisma Lavin Peredo, Alessandro Bonora). Animated Feature-Independent. The Breadwinner. Angelina Jolie helped produce the film, based on Deborah Ellis’ children’s novel of the same name, which follows a young girl in Afghanistan who disguises herself as a boy to provide for her family. She walked the red carpet with two of her children, and the film’s director. 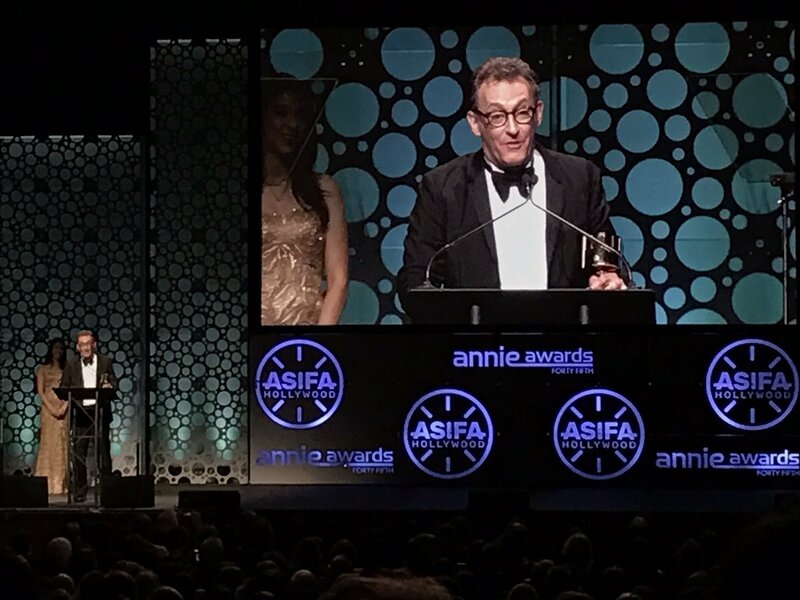 TV Voice: Tom Kenny won for SpongeBob Squarepants. He has voiced SpongeBob for the past 17 years. 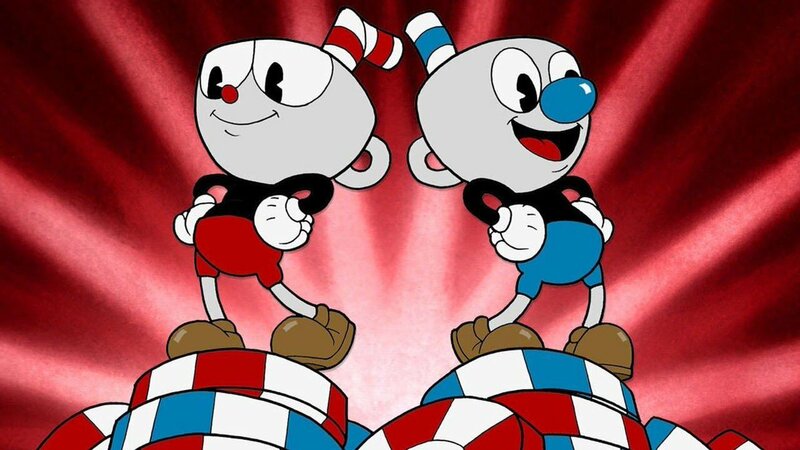 Character Animation in a Game: Cuphead, which uses 1930s 2D animation style in a video game. June Foray Award: Didier Ghez, for significant and benevolent or charitable impact on the art and industry of animation was presented to animation historian. Certificate of Merit: David Nimitz, devoted friend and caretaker of veteran voice actress and ASIFA-Hollywood and Annie Award pioneer, June Foray, who passed away last July at the age of 99. 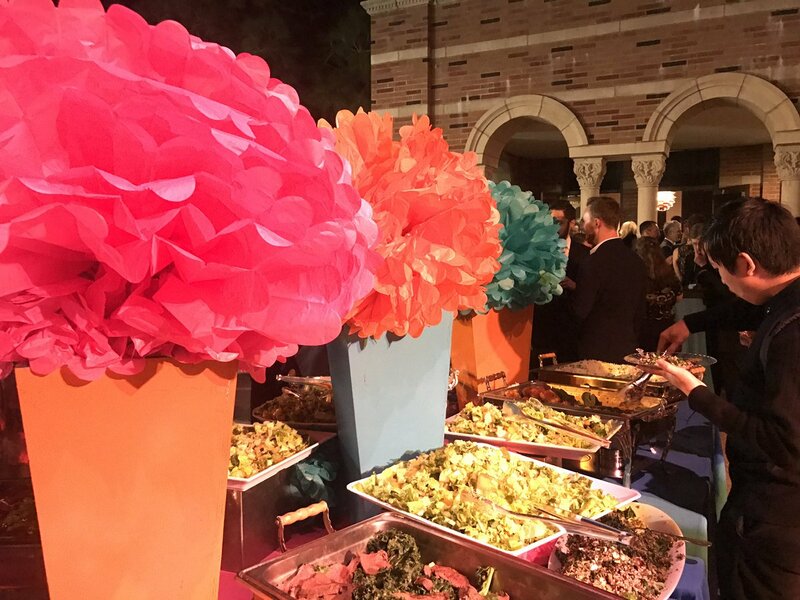 Presenters for the evening included actress Wendie Malick; Coco’s Anthony Gonzalez; Director Nora Twomey and actress Saara Chaudry from The Breadwinner; Disney voice talent Russi Taylor; SpongeBob himself, Tom Kenny; Animators Mark Henn and Floyd Norman, and other industry notables, including Debi Derryberry, and E.G. Daily, along with ASIFA-Hollywood President, Jerry Beck, Executive Director, Frank Gladstone and animation producer and ASIFA board member, Sue Shakespeare. 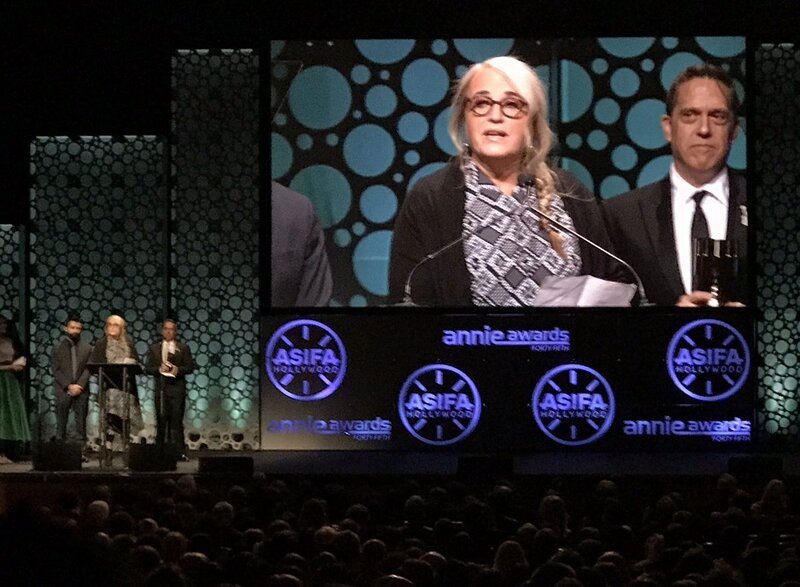 The ceremony was live-streamed again this year at www.annieawards.org/watch-it-live where animation enthusiasts and those unable to attend the event. 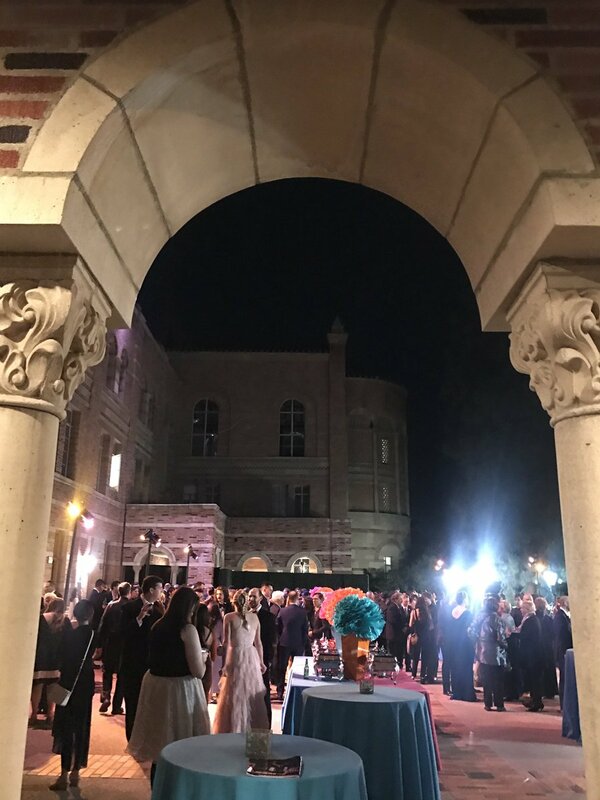 After the awards, VIP guests attended the after-party on the patio. Created in 1972 by June Foray, the Annie Awards have grown in scope and stature for the past four decades. For more information on the Annie Awards™, please visit www.annieawards.org. For information about ASIFA-Hollywood, visit www.asifa-hollywood.org.